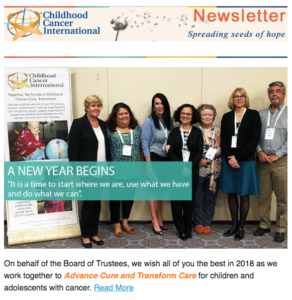 Childhood Cancer International have published their first newsletter of 2018, and it’s packed with great stories from around the world! 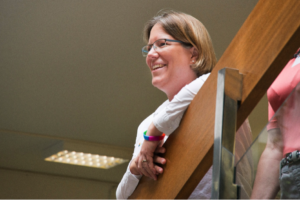 PanCareLIFE is one of the stories featured – we’re delighted to work with CCI and to have a survivor representative join our meetings. 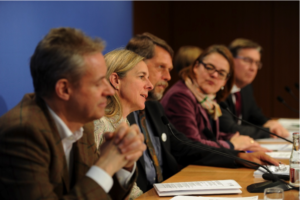 PanCareLIFE’s Anja Borgmann-Staudt from Charité – Universitätsmedizin Berlin participated in a press conference in Berlin about patient education regarding fertility and about payment for fertility preservation measures. Currently, insurers provide full coverage in Finland, France, Italy, Poland and Turkey, but not Germany. 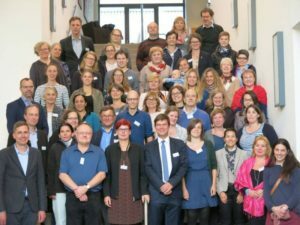 Members of the PanCareLIFE consortium met in Mainz, Germany for the 9th PanCareLIFE General Assembly Meeting, 08 – 09 November 2017. Now that the data has been cleaned and harmonised at the Data Centre in Mainz, our focus has moved to the planned analyses for fertility, ototoxicity and quality of life that we’ll undertake in the coming year. We also heard about progress in the development of fertility guidelines. As we enter the final year of the project, we are also focused on publication planning and organising our final conference, to be held in Paris on 26 Oct 2018. If you are interested in the final conference, please contact Kylie O’Brien (kylie.obrien@pintailservices.com). Survivors play a very important role in the network, so the PanCare team has prepared a video explaining the importance of listening to survivors. The team has also produced a video explaining why curing cancer is not enough, highlighting the impact of late effects on survivors of childhood and adolescent cancer. 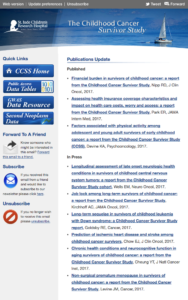 The latest newsletters from the Childhood Cancer Survivor Study and Long-Term Follow-Up Study are now available. 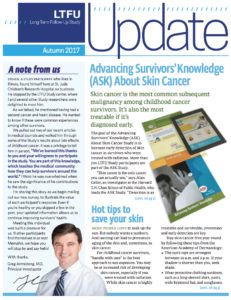 Learn more about the Advancing Survivors’ Knowledge (ASK) About Skin Cancer Study, meeting survivors’ health-related needs, the next wave of the Long-Term Follow-up Study and more! 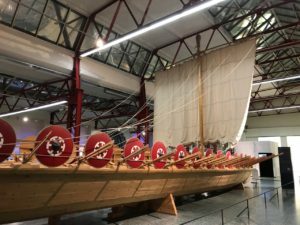 The 20th PanCare meeting was held 3 – 5 Oct 2017 in Luebeck, Germany, hosted by PanCareLIFE WP5 leader Thorsten Langer. The meeting covered a range of topics, including guidelines and practical consequences for endocrine long-term late effects, survivorship and long-term follow-up guidelines after stem cell transplantation. There were also updates from the PanCare EU projects, PanCareLIFE and PanCareSurFup. Dirk Deuster (UKM) gave an update on the PanCareLIFE ototoxicity study, and Elisabeth Korte and Magdalene Balcerek (CU) gave an update on the PanCareLIFE study on patient education in fertility preservation. 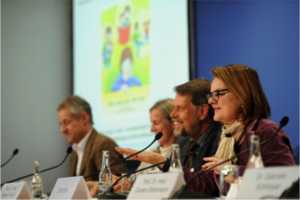 The first Workshop on Long-Term Care after Childhood Cancer in Germany was held in Bonn 27 – 28 September 2017, hosted by the German Childhood Cancer Foundation and PanCareLIFE researchers Dr. Gabriele Calaminus and Prof. Dr. Thorsten Langer, who also represent the German Pediatric Oncology and Hematology (GPOH) Society working group on long-term surveillance. In the last few years, long-term care after childhood cancer has become an important focus as treatment and survival rates have improved substantially. 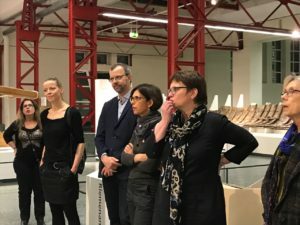 To define needs and expectancies on the future long-term-care structure in Germany, survivors, professional experts and other stakeholders met at the workshop. Researchers gave presentations on high priority late effect issues. Survivors’ experiences and day-to-day difficulties were also discussed at the workshop. Six dedicated focus groups were established to continue discussions on future medical and psychosocial long-term care, education and occupational issues, health behavior and secondary prevention, as well as future research infrastructures. All participants agreed that the workshop was an effective communication platform and hope to see continued dialogue on these important topics. You can read more in German here. 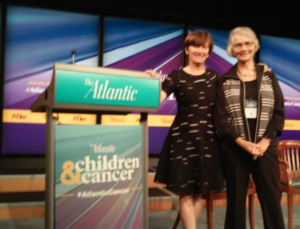 PanCareLIFE Research Manager Dr. Julianne Byrne (Boyne Research Institute) attended the Children & Cancer Forum last week in Washington, DC. The conference featured presentations and discussions by clinicians, researchers, parents and survivors, on topics ranging from immunotherapy to big data to survivors’ stories to underwriting. The conference was sponsored by the AFLAC insurance company and was held in the Newseum on Pennsylvania Avenue, within sight of the US Capitol building. Congressman Brian Higgins, chair of the House Cancer Caucus, spoke about how policy-makers like him need to be informed and educated about issues related to childhood cancer and survivorship. 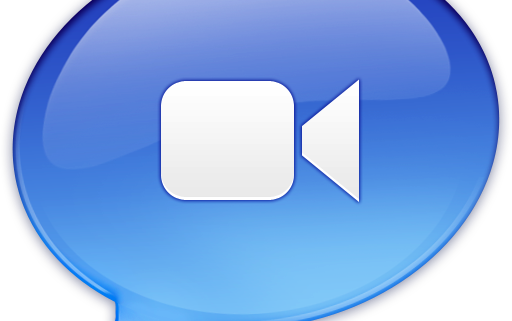 The full video of the conference proceedings is available here. 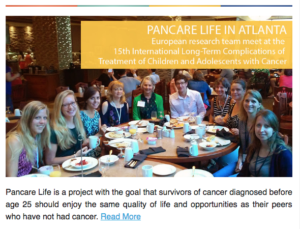 Sept 2017 PanCareLIFE Newsletter out now! Check out all our latest news here! 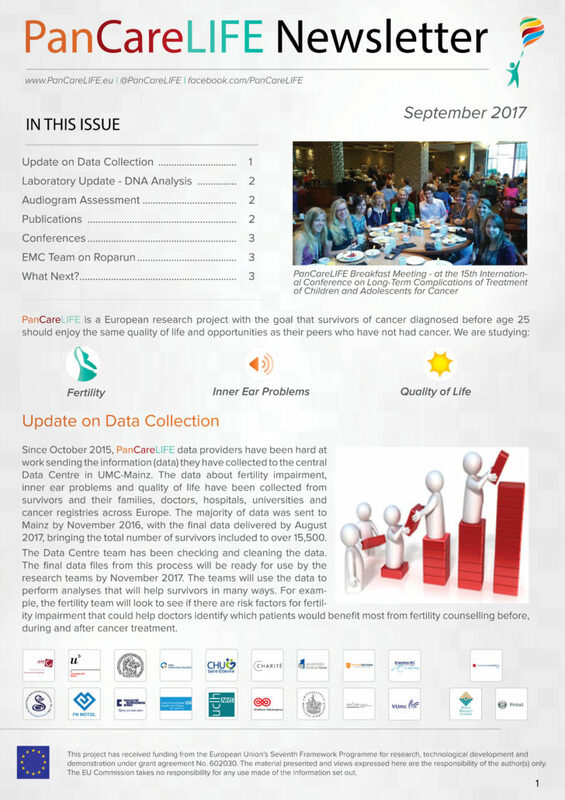 http://www.pancarelife.eu/wp-content/uploads/2016/09/newsletter.png 664 782 pcl_admin http://www.pancarelife.eu/wp-content/uploads/2013/11/pcl_web_logo1-300x137.png pcl_admin2017-09-01 08:45:332017-09-01 08:46:03Sept 2017 PanCareLIFE Newsletter out now! 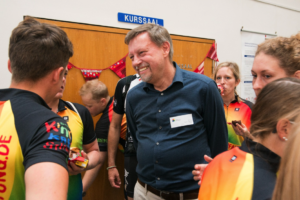 On August 25th 2017, the Rainbow Riders visited the German Childhood Cancer Registry (GCCR)* in Mainz on their tour from Trier / Aachen to Koblenz. 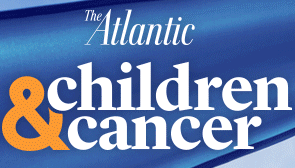 Approximately 50 participants on the bicycle tour suffered from cancer in their childhood and adolescence. 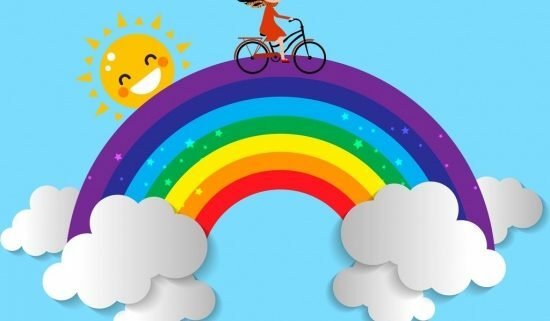 Now, with the Rainbow Ride, they provide a sign of hope and encouragement to children currently battling cancer and their parents. 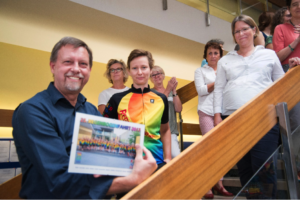 They visited the GCCR and the pediatric oncology center of Mainz University Hospital on their one-week 600-km jubilee tour to share their important journey. 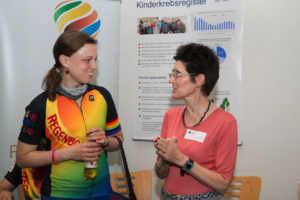 The visit of the Rainbow Riders highlighted the importance of a nationwide collection of disease-specific data. Since 1980, the GCCR has collected data on all cancer cases in Germany in children under 15 years of age, with data from adolescents under 18 years of age being collected since the beginning of 2009. The registry currently receives about 2,100 reports of new disease each year. In addition, the GCCR carries out a systematic long-term follow-up. 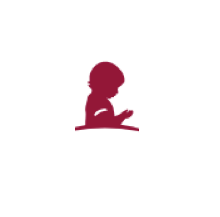 About 33,000 former childhood and adolescent cancer patients are regularly contacted by the GCCR to learn about their general health status and potential late-effects of their cancer in childhood and adolescence. The aim is to optimize future treatment methods and follow-up care. It was very impressive to see how much strength and courage the Rainbow Riders provide to the children and adolescents who are currently affected by cancer. Both the Rainbow Riders and the hosts in Mainz will remember the visit fondly in years to come! 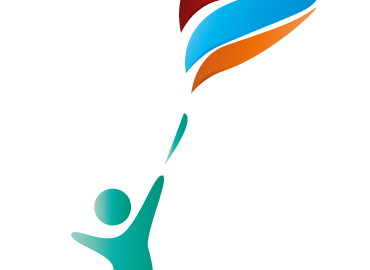 * The GCCR coordinates PanCareLIFE and participates in the PanCare network (www.pancare.eu). In both PanCareLIFE and PanCareSurFup (www.pancaresurfup.eu), the GCCR hosts the data centre (WP1), which is responsible for data collection and harmonisation for all datasets collected from the data providers in both EU-funded projects.